Gasoline, lubricants, and consumer products are improved by chemical additives. Making additives often involves a chemical reaction known as alkylation, the addition of a carbon chain to existing molecules. Chemists know acid catalysts are useful for alkylation, but how one of the most popular catalysts, acidic zeolites, perform alkylation in a condensed phase is not well understood. Jian Zhi Hu, Zhenchao Zhao, Hui Shi, Johannes Lercher, and their colleagues from Pacific Northwest National Laboratory identified a key reaction mechanism associated with zeolite-catalyzed alkylation of phenol with cyclohexanol. They made this discovery using in situ high-temperature and high-pressure magic angle spinning nuclear magnetic resonance (MAS-NMR) spectroscopy. Scientists now have an understanding of how the catalytic activity, mechanism, and reaction pathways depend on three factors. These factors are the concentration and strength of acid sites, the steric constraints for the reaction, and the identity of the alkylating agent. Detailed kinetic and spectroscopy analyses showed that phenol alkylation with cyclohexanol does not appreciably occur before a majority of cyclohexanol has been dehydrated to cyclohexene. 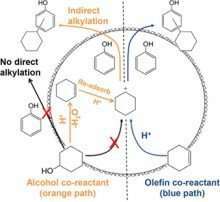 Alkylation reactions are slowed as long as the alcohol is present. In contrast, alkylation products are readily formed when the solution initially contains just phenol and cyclohexene. A combination of in situ MAS-NMR spectroscopy and the use of carbon-13 isotope enriched phenol and cyclohexanol allowed the identification of the reaction pathway that is difficult to probe by other spectroscopy methods. The reaction sequence does not occur as a result of competitive adsorption but by the absence of a reactive electrophile. This is due to the preferential formation of adsorption complexes, i.e., protonated alcohol dimers at Brønsted acid sites, which hinder the adsorption of cyclohexene. At low coverage of the acid sites by protonated dimers, cyclohexene adsorption and protonation yields cyclohexyl carbenium ions, which attack phenol to produce alkylated products. This further implies that protonated cyclohexanol dimers dehydrate without the formation of carbenium ions. The results show the importance of NMR spectroscopy as a unique in situ analytical method, providing detailed molecular information on the sample studied under real world conditions (operando). "Experts in catalysis and NMR worked together to allow us to watch important chemical processes occurring at high temperatures and pressures," said Karl Mueller, PNNL's Chief Science and Technology Officer for Physical and Computational Sciences. "Before, we had to infer what was happening by either stopping the reaction (i.e., ex situ) or only measuring the final products, neither of which can show us a complete picture." With insights about the crucial reaction pathways and how NMR spectroscopy can contribute, the team is continuing to explore new reactions and catalysts to produce energy carriers, or molecules that store energy in the chemical bonds.